At a press conference related to federal cuts to New York State, Governor Cuomo announced he would call a Special Session of the Legislature if Disproportionate Share Hospital (DSH) funding cuts that took effect on October 1, 2017 are not repealed by the end of the year. He also announced that he would reconvene the Medicaid Redesign Team. 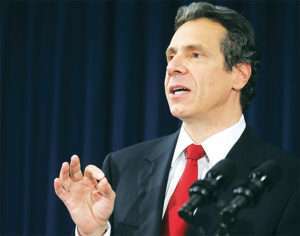 He outlined four areas where the federal government has proposed or enacted cuts that would have a disproportionate impact on New York: DSH funding, Child Health Insurance Program (CHIP), the proposed elimination of the tax deduction for state and local taxes and the failed Grahm Cassidy repeal of the Affordable Care Act. The DSH cuts will result in a shortfall of $1.1 billion in this federal fiscal year and $2.6 billion when fully implemented. The State has engaged KPMG to analyze the affected hospitals to provide information about each hospital’s financial situation that would be used to implement the cuts. The cut to the CHIP program also took effect on October 1, 2017. The federal government provided $1 billion to support New York’s CHIP program, which provides coverage to 330,000 children. These two cuts trigger a provision in the 2017-18 State Budget that requires the Governor to develop a plan to implement any cuts in excess of $850 million, which the Legislature would either approve or pass an alternative plan. Even without these cuts, New York is facing a $4 billion deficit for the 2018-19 State Fiscal Year.